I have five streaming media players in my house. 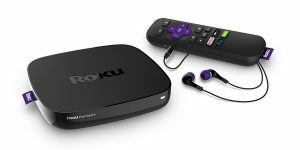 An Apple TV (1st gen), Amazon Firestick (1st gen), Chromecast, Roku 3, and now a Roku Premiere Plus. They all have their ups and downs but I will say that I despise the Amazon Firestick which the Premiere Plus has replaced. The Amazon Fire stick is unreliable, crashes once a week, the remote is finicky and likes to scroll a single way until the batteries are pulled, and the interface is terrible and slow. I’ve been told that the second generation is slightly better but the Fire TV is the best way if you want in the Amazon Ecosystem. The Roku 3 has been the best out of all of them, next to the Chromecast which only relies on your phone. The Roku Premiere Plus takes all of the great things of the Roku 3, and makes it better and faster. The interface scrolls beautifully and smooth, Netflix and Hulu load twice as fast, and Wi-Fi has been more stable. Although the cost is high, I’d recommend it over any of the others I’ve used but I will say that I’m interested in playing around with the Nvidia Shield TV. Is it worth the upgrade from the Firestick? Absolutely. From the Roku 3? Meh, it’s noticeably faster, but I’ve had almost zero issues with the Roku 3 in my office. If you need 4k, just buy it already. This is hands down my favorite streaming device. The Roku interface is buttery smooth, the convenience of the headphone connection in the remote is helpful with a light sleeping wife, and the remote is better than the previous generations.